Day 16 Full-timing it. Our family selfie…. some are blinded by the light. In January I joined Chris on a business trip to Italy. It was amazing. It was the beginning of 2015 and everywhere I looked, there was history, a legacy, layers of life and stories literally stacked upon each other. Italy was fabulous. Rome, the first civilization…is literally living, vibrant life buried under layers of history that are constantly being unearthed and discovered. I was once again reminded with the simple fact that this life is brief. Circumstances change, love ones are taken Home, children grow up. That desire to to have the house with the picket fence…well, it has morphed into the “my children are growing up at light speed and I just want to scoop them up, love on them and disciple them into young adults that love the Lord, serve Him and enjoy life to the fullest.” So at the end of that trip, I found myself telling my amazing, awesome and adventurous husband that I had decided it was time for us to have that adventure. Well, lets just say he didn’t need much convincing. Those that know us, know that Chris travels every week for work. He has an amazing job and he loves it…so we love it. However, he is gone A LOT. Two years ago I started homeschooling my kids. Since we have flexibility, why not truly utilize it? So as a family, we decided to go for it. We sold the couches and most of the furniture, put the rest of the stuff in storage, traded in the the travel trailer for a fifth wheel and left the house on March 31, 2015. We followed Chris to Palm Desert for some business and were able to meet up with family for a little reunion in the desert. I look forward to being a part of your journey and being there whenever I can. Our prayers are that you are blessed during this wondrous journey and the opportunity of seeing God in His soft whispers in the early morning and His endless depth of stars in the night sky next to his endless sea or carpeted forests. Take surf classes and learn to breathe underwater as your family of fish become one! After all, you’re Barrys! Thank you Lysa. 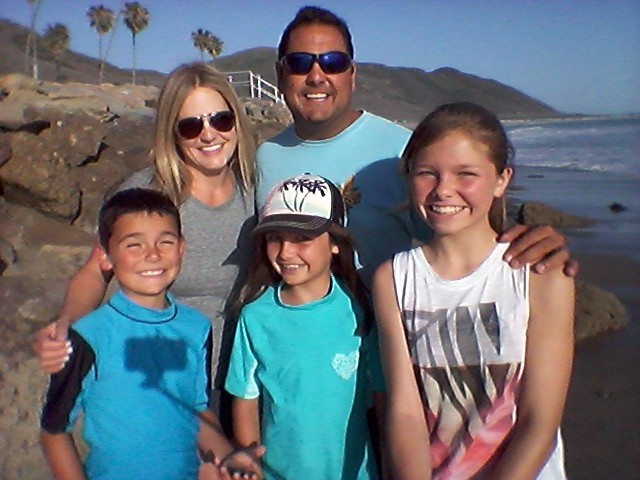 We love our Ventura beach visits with you!